The Indian Institute Mater Dei, housed in the former Augustinian Convent of Santa Monica in Goa, has become the hotbed of feminist theology in South Asia. 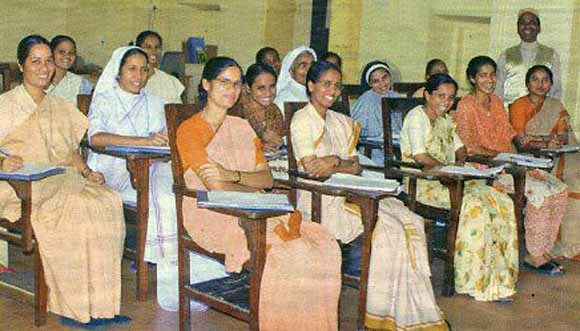 The young nuns who attend classes there - some of them taking a break between classes above - are encouraged to redress India's male-dominated culture, both in secular society and in the Catholic Church. 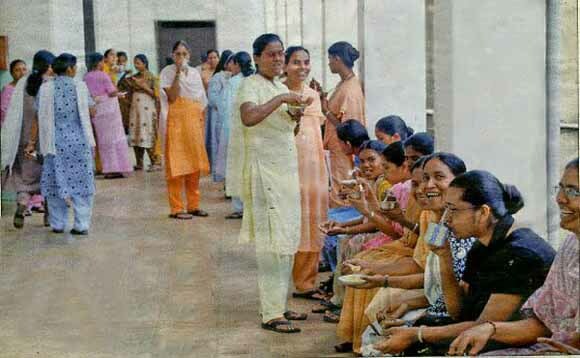 This Institute is a symbol of the intent of Indian religious women to shape a new feminist reality in a nation where women outnumber men 4 to 1 in religious vocations. The students include members of 26 religious orders who want to erase from the panorama the traditional idea that sisters must be silent and obedient. These young women in their 20s and 30s did not know the Church before Vatican II and are being schooled in its directives to bring the Church into the world. Their formation is also oriented toward taking over the leadership of old sisters in their respective orders to win a voice for the younger ones and establish a more democratic process. Their curriculum includes liberating the poor from "the structures of sin," ecumenism and inter-religious dialogue, with the corresponding adoption of Hindu and Islamic "values" into their life and spirituality. Ecology and its philosophical developments are also highlighted in the courses.